Werte! Anwerne akangkeme anthurre arrantherre apetyeme Mparntwe Desert Park-werne. Apmere nhenhe Arrernte angkentye mape-kenhe. Aboriginal people have always been referred to as nomads but this does not truly explain the extensive knowledge and understanding that the people have for the environment. For instance, designated areas that particular bands had responsibility for were used in ways where there was an even spread of resource usage across the tribal area. Moving in camp cycles and the use of fire in controlled methods helped to achieve equilibrium between the people and the environment. The use of fire by men in hunting to flush out game and the firing of areas that were being vacated in the cycle, created a mosaic or patchwork of burnt and unburnt areas from which regeneration could take place. Upon returning to vacated sites in the cycle, the people could re-establish camp with the knowledge that hunting and gathering could again take place with adequate resources available in the area. The modern term for this is firestick farming. In Arrernte language, there isn’t a word for the English word farming but there is a word and plenty of stories of the tool used - Ure! (Fire). At contact, the Aboriginal economy was based on a stable, considered management of the environment and an effective organisation of labour. Males and females made different but complementary economic contributions. Women were primarily the gatherers of vegetables, roots, herbs, fruits and nuts, eggs and honey, and small land animals such as snakes, goannas. Men were the hunters of large land animals and birds and also co-operated to organise large-scale hunting drives to catch emu's and kangaroos. The collection and preparation of this wide variety of bush food required the development of an efficient, multifunctional technology, considerable practical skills, and its seasonal changes. Some plant foods were easy to collect but required complex preparation before they could be eaten. There is no Australia-wide single language and culture. This is a land of diversity of culture and language, belonging to many different Aboriginal nations. There are about 1,700 words for Aboriginal person across Australia: Koori, Murri, Arelhe (Arrernte), Anangu (Western Desert), Yapa (Warlpiri). Prior to colonisation there is believed to have been approx 500 languages in Australia, sadly over the past 214 years we have lost more than half of those languages. Language, culture and land are inextricably linked - where people have lost ownership over their land (coastal and alluvial areas where best living and farming lands are) their language and culture have deteriorated. Here in Central Australia - in the arid desert regions - what draws people together is their ability to live on this dry arid land, and what gives them their individuality is the type of landscape that they live in. This is what gives rise to their different languages. Central Australian Aboriginal people have pretty much had custodianship over their land continuously for thousands of years so language and culture are very strong. While you are walking around town you will notice that the Aboriginal people are speaking languages other than English. They are more than likely speaking one of three main language groups: Arrernte, Warlpiri or Western Desert. There are languages and there are dialects. Dialect meaning fairly closely related varieties of a language where speakers of one dialect can understand most of what speakers of another dialect is saying. Beside us lies the MacDonnell Ranges. The language spoken here and along the East and West MacDonnell Ranges is Arrernte. 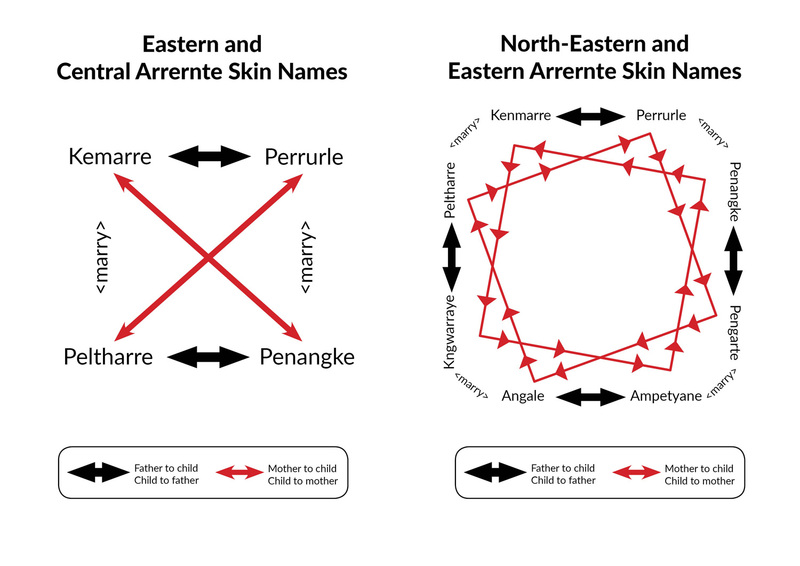 This language is broken up into dialects Central, Eastern, Western (starts at Jay Creek) and Southern Arrernte. In Arrernte family, or kinship systems, we recognise our relations by blood and by marriage as in other societies. We also regard ourselves as being related (although not biologically or by marriage) to all the people within our cultural or linguistic region. Our kinship system group various categories of relations together as a sort of mental map so we know who we are related to, and how we should behave towards each other. The whole cultural group may be divided into two, four, six or eight sections.